After struggling to start the previous week, the Raptors have now won five straight games. Kawhi is playing like a MVP candidate and the development of Pascal Siakam have this team clicking on all cylinders. A close loss to the Suns shouldn’t overshadow convincing wins over some of the West’s better teams: the Nuggets, Trail Blazers, and Spurs. As long as Giannis continues dominating the Bucks will be a top team for the remainder of the season. Have a week Kevin Durant. He averaged 34 points, 12 rebounds, 6 assists, and 3 blocks in the three games the Warriors played last week. While Curry should be returning from injury soon, Durant is keeping the team near the top of the standings until then. 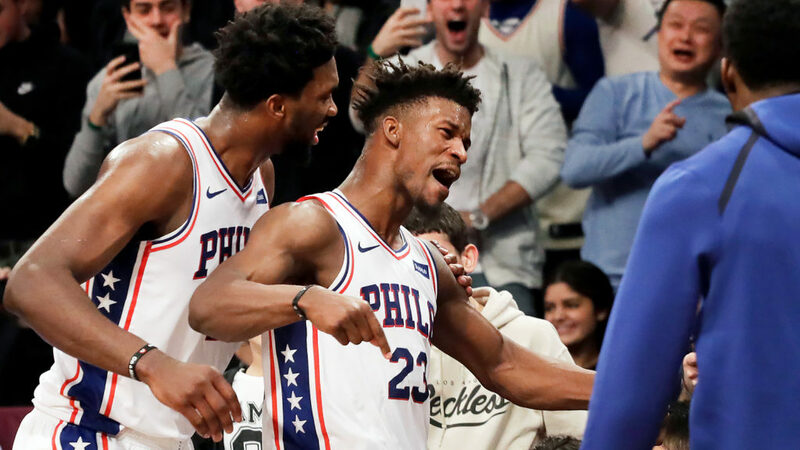 Since the acquisition of Jimmy Butler the 76ers have gone 5-2 and are averaging 117 points per game, which would currently rank them third in the NBA. While most teams take awhile to build chemistry when they acquire an All-Star, the 76ers have been successful from the get-go. Denver got back on track last week by winning three of their four games. With Will Barton due back from injury soon, the Nuggets already efficient offense could get even better. The Clippers are currently in first place of a stacked Western Conference. Not many people could have expected that after six weeks. Winners of seven of their previous eight games, the Clippers will look to keep rolling this week against Phoenix, Sacramento, and Dallas. 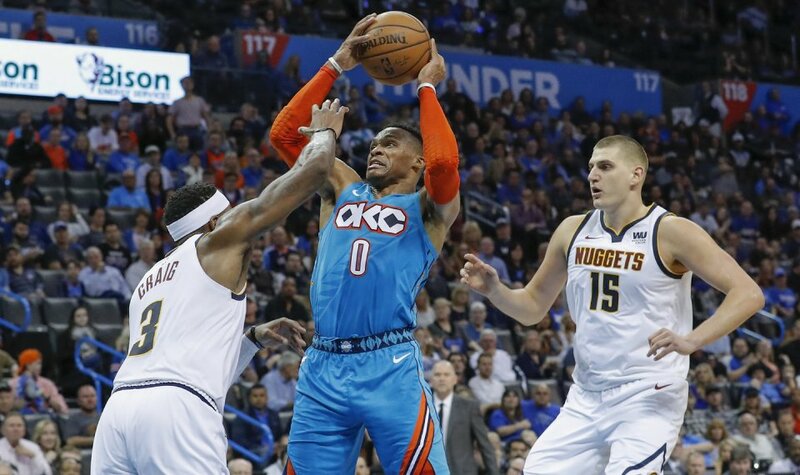 While the Thunder only went 2-2 last week, the big news was the return of Russell Westbrook. They should be able to start a winning streak this week, with only two games coming against subpar opponents in the Cavaliers and Hawks. The Lakers had another winning week last week, going 2-1. More good news, they won’t have to play the Magic anymore, having already lost both of their matchups with them this season. Portland had a bad week, going 1-3 with their only win coming against the Knicks. Their three losses did come against the Bucks, Warriors, and Clippers, who are all top-6 teams in my rankings. Things won’t get much easier this week, however, as they have to play the Nuggets and Spurs. The Grizzlies ended their five game losing streak last week in an overtime loss to the Clippers, but they are still well in the hunt for a Western Conference playoff spot. They’ll have two extremely tough matchups this week with the Raptors and 76ers, but I wouldn’t count out the chance of them winning one of those two. Indiana went 0-2 last week without Victor Oladipo. While he may not return this week, Tyreke Evans and Aaron Holiday have been filling in well enough that they could win at least two of their upcoming four games. It’s no secret that the Celtics have been struggling, losing four of their past five games. They may need to make some trades just to mix up the chemistry in the locker room. It wouldn’t be shocking to see Terry Rozier traded before 2018 is over if the Celtics continue struggling. After winning six of their previous seven games, the Pelicans are now in the middle of a three-game losing streak. They’ve proven to a be a streaky team so far this season; winning four, then losing six, then winning six of seven, and now losing three. While they may lose Monday to the Celtics, they should be able to start another winning streak with games upcoming against the Wizards and Heat. The Rockets lost a tough overtime game against the Pistons, thus ending their five-game winning streak, and followed it up with a Chri Paul-less lost to the Cavaliers. They’ve showed this year they’ll need both Chris Paul and James Harden if they want to make the playoffs in a super competitive Western Conference. The Pistons had a strong week last week, going 3-1. Blake Griffin and Andre Drummond have been playing like a slightly better version of Griffin and DeAndre Jordan duo and they should be able to lead Detroit to a playoff seed this season. 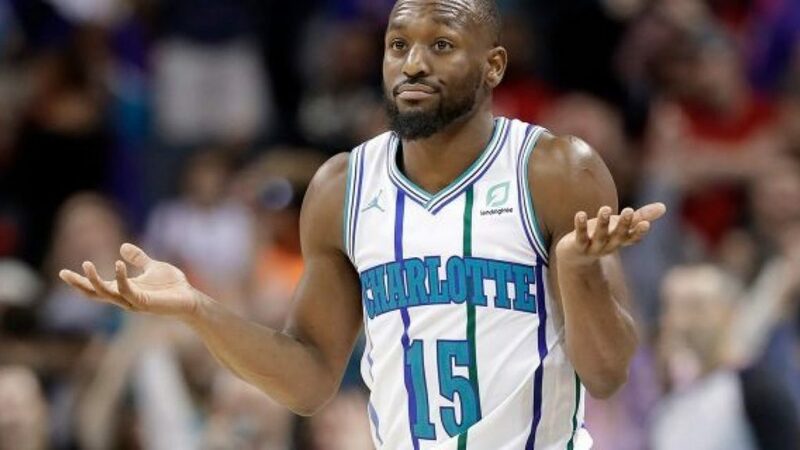 Charlotte started their week off on a high note with victories over the Celtics and Pacers, but ended their week with a loss to the Hawks. They’ve missed Michael Kidd-Gilchrist more than expected in their past few games, but he should be returning to action this Monday against the Bucks. Another rough week for the Spurs, as they went 1-3. They’ve been falling off pace for a playoff spot these past two couple of weeks and they’ll need to get back on track soon if they want to keep up with their loaded conference. The Kings continue to be competitive in just about every game they play, which is all you can ask for from such a young roster. They likely won’t be in contention for the playoffs by seasons end, but they’ll be a team you’ll need to take serious in the next couple of years. Winning six of their previous seven games, the Mavericks are really hitting their stride. Luka Doncic is the clear front-runner for Rookie of the Year and he may be able to lead this team to a playoff spot. The Magic lost two of their three games last week, but they did beat the Lakers for the second time this season. For a team without a go-to playmaker at the point, they’ve exceeded expectations at this point in the year and they don’t look like they’ll be slowing down anytime soon. Believe it or not, a year after making it to the second round of the Western Conference Playoffs, the Jazz are tied for the second worst record in the West. They’ve certainly been struggling lately, losing five of their past seven games. With Donovan Mitchell currently dealing with an injury, this team may face some more adversity before things start to get better. Minnesota has been playing better since trading Jimmy Butler, winning five of their past seven games, but Andrew Wiggins is struggling once again. He’s averaging 9 points per game in his previous four games, including scoring zero points while taking 12 shots against the Bulls. The Nets are struggling but that’s a good thing. They finally have their own first round draft pick this season and could potentially pair a top-10 draft pick with an improving D’Angelo Russell and an upcoming Jarrett Allen. Last week it was reported that the Wizards would be open to trading anybody on their team. That must’ve woken up some of their players, as they finally had a winning week, defeating both the Clippers and Pelicans. Hopefully they can get back to their losing ways so we can see a blockbuster trade sooner rather than later. The Heat have lost seven of their previous nine games and they’re starting to get mentioned in some serious trades. There have been reports of them offering Dragic and some key role players in the hopes of acquiring John Wall from the Wizards. Regardless of the deal, it’s always interesting seeing big market teams shopping around some of their best players. What a week for the Knicks! They won three of their four games and all three wins came against quality opponents. It may not be in their best interest to start winning games but you have to respect the job that David Fizdale is doing with one of the worst rosters in the league. The Bulls have lost six of their past seven games and look like a shoe-in for a top-5 pick this summer. They could have a very interesting young core come next season, so Bulls fans should stay patient and not overreact to all their losses. Phoenix has been starting Devin Booker at the point alongside three wing players in Trevor Ariza, Mikal Bridges, and TJ Warren. It’s a very interesting lineup that has made them more competitive as of late and they should continue to do so if they want to start winning more games. It’s a miracle; the Cavaliers have finally risen from the bottom spot of these rankings. After losing a close game in LeBron’s return to Cleveland, the Cavs have reeled of back-to-back winnings against the 76ers and Rockets. Collin Sexton is finally starting to live up to his expectations and he should give fans some kind of hope for their long-term future. While the Hawks ended their 10-game losing streak with a win over the Hornets, they are still currently the worst team in the NBA. They’ve been recently starting rookie Kevin Huerter over Kent Bazemore and what looks like an attempt at developing the young player while also tanking for a top-3 draft pick.